According to sources, finally Apple decided to announce iOS 8 at this year WWDC. I hope all of you seen several of leaks, rumors and sources say that iOS 8 will contain fresh new features such as the notification improvement, flatter design, minimum color, Healthbook application and more. 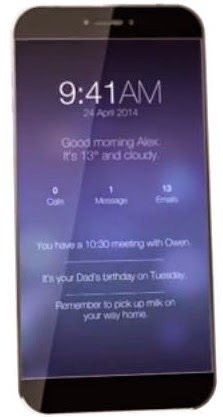 TechRadar has published new concept Video that shows what iOS 8 could demonstrate on the iPhone 6. In new concept video tell us that what a better notification center could appear, easily to read notification, Interface clean and more detail. There is new apps such as Edit the text and Preview. In this video you can looks how the rumored iWatch and Healthbook application could act. If you are driver then you can also get Carplay feature in this video. It shows you how the iPhone could act when you are driving your car, preventing you faraway from interruptions. New iOS 8 will gives you various improvements, including apps updates such as Mail, Messages & Maps. If you talk about iOS 8 Battery life and performance could also be better. Now, tell me your views of this concept Video, What are the other improvements or features will Apple bring to fresh new iOS 8?